Camping at the beach is a popular travel option for singles, couples and families. While there are many, who prefer to stake their tents to a forest floor, an increasing number of campers are choosing to be lulled to sleep by the gentle roar of the ocean. Fortunately, with thousands of beach camping parks located across the United States, travelers have plenty of options. New Hampshire's Hampton Beach State Park offers campsites with ocean views. Within the park, visitors can take part in swimming, fishing, hiking, and picnicking. There are also two shower facilities within the park and grilling stations dotted around the area. The town of Hampton Beach, which surrounds the park, is one of New Hampshire's top beach destination. The local community is home to a wide range of shopping, dining and entertainment offerings. Visitors especially flock to the town for the annual Seafood Festival, which is usually held in September. Reservations for camping spots are recommended and can be made online. Located on North Carolina's Crystal Coast, this state park offers marina side camping. In addition to sunbathing on the nearby beach, the park offers hiking and the chance to take in some unique plant life, including the rare Venus flytrap. If laying in the sun isn't your thing, fishing at the park is an excellent option. The surrounding town of Carolina Beach is home to surf shops, local boutiques and plenty of Southern-style seafood. Water and hot showers are also available on site. Reservations are not required for groups of up to six people, though they are strongly recommended. Parties of six or more must reserve a group campground in advance. On-site picnic and grilling facilities are available for a daily surcharge. Reservation requests, current pricing and park rules can be seen on the park's website. Myrtle Beach, South Carolina's Lakewood Camping Resort offers 1200 scenic lakefront, ocean front or wooded camp sites. Just about all campsites are able to accommodate RVs or tents and offer water, cable television, propane gas delivery, telephone hookup and 20, 30 & 50 amp power pedestals. Internet access is available on site. Pets are welcome and laundry facilities and bathhouses are located on-site. Campers can also enjoy volleyball, a heated swimming pool and a whirlpool spa. In addition, the resort hosts daily events for guests, from cookouts to outdoor concert series. Located in busy South Myrtle Beach, the resort is surrounded by family-friendly entertainment options, from mini golf to amusement parks. Reservations are required and can be made via the Lakewood online reservation system. Prices vary depending on the accommodations you select. Georgia's Jekyll Island is famous for its beaches, its majestic oak trees and its historic ruins. Jekyll Island Campgrounds gets you close to all three. Here, you can camp under the oaks, walk across the street to the beach or rent a bike to explore the island's historic sites. On site, you'll also find a fishing pier, grills and picnic areas, hiking trails and a convenience store stocked with snacks and camping supplies. Wi-fi, water and electric are also available. Reservations are recommended and can be made online. Jekyll Island is a small community and local restaurants and shops are within easy reach of the park. The island is also home to the Georgia Sea Turtle Authority, a sea turtle habitat preservation group, which offers guided tours and special events. Visit their website for a current event calendar. Located in the Florida Keys, Long Key State Park offers the ultimate in beach camping - you get to set up your tent right on the sand. Fishing enthusiasts flock to this campground in droves for the bonefishing. In addition to fishing, snorkeling, swimming and sunbathing, you can rent a canoe and paddle through the surrounding lagoons to explore neighboring islands. There are also hiking trails and an observation tower offering stunning views of the Keys. There are also guided and unguided canoe and hiking tours. Reservations are recommended and can be made up to 11 months in advance. Each campsite has water, electricity, a grill and a picnic station. There are hot showers in three restrooms scattered around the property. Pets are welcome inside campsite areas, but not along the shoreline or in picnic shelters. Long Key State Park is relatively remote. There are convenience stores within 10 miles of the park, but restaurants, grocery stores, laundry facilities, and other attractions are further away, so come prepared. Navarre Beach Campgrounds welcomes vistors to the northwestern Florida Gulf Coast community of Navarre year round. The park sits on the Santa Rosa Sound and offers waterfront camping as well sites within walking distance of the park's beach. The campground offers planned activities, a swimming pool, game room, fishing pier, fitness center, laundry facilities and showers. There is also a convenience store and gift shop in the park, and Wi-Fi is also available on site. Booking in advance is required. 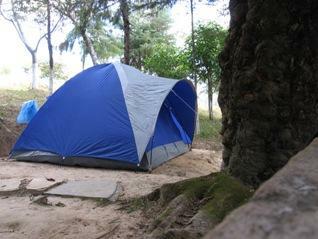 Costs for camping vary depending on time of year and how close to the beach you wish to camp. You can reserve your site online at the park's website. Camp Gulf is located right on one of Florida's most beloved Gulf Coast beach towns, Destin. The park boasts a wide range of amenities, including water slides, an activity center with video games and group activities, a gaming center, a fishing lake, showers, two pools and laundry facilities. There is also a convenience store, business center, ice cream shop and gift store on site. The surrounding town of Destin is a major tourist destination in Florida and is home to an array of local and chain restaurants, shops and nightclubs. Reservations are required for Camp Gulf. Bookings can be made online. At California's Pismo Coast Village RV Resort, campers can enjoy viewing the sun setting over the water while relaxing beachside. Amenities include Internet hookups, cable television, bicycle rentals, a general store, a laundromat and bicycle rentals. There is also a on site restaurant open during the summer months. Pismo Beach, the town surrounding the park, is located about halfway between Los Angeles and San Francisco. In addition to nearby dining and shopping options, you can also participate in wine tastings at local vineyards. Reservations are recommended and can be made online. If you enjoy more primitive state park camping, Silver Strand State Beach, located in Coronado, California, is the campground for you. Campers can enjoy swimming, boating, water skiing, picnicking, fishing and volleyball. Rest rooms and showers are available, and all campsites come with fire rings. Wireless computer service is also available. The Silver Strand Beach Cafe, which offers ice cream and sandwiches, is open from Memorial Day to Labor Day. The nearby town of Coronado offers shopping, dining and nightlife. The park is also close to San Diego, home to the famous San Diego Zoo. Reservations are not required but strongly encouraged. Online booking is available. If it's rustic, laid back camping you're looking for, Pacific Beach State Park in Washington is perfect for your lifestyle. In addition to beachcombing, campers can enjoy hiking, fishing, clamming, bird watching and swimming. You can also enjoy campfires on the beach, though fires are not allowed within the actual camping areas. You are encouraged to buy firewood from a local supplier to avoid introducing new insects to the local habitat. Two restrooms and six showers are available on site. Other amenities are sparse, though there are grilling and camping areas. The neighboring town of Pacific Beach is very small but unique and fun for visitors to explore. There are several locally owned restaurants, convenience stores and gift shops filled with unusual eats and one of a kind items. Reservations are required and can be made online. Beach camping is extremely popular, and chances are that no matter what your destination, there is more than one camping site nearby. How do you pick which place is right for you? The answer depends on what you're looking for in a vacation. State parks tend to have fewer amenities, but are quieter. Campsites that double as RV parks and cabin resorts offer everything from Wi-Fi to cable TV, but are more crowded. Match the campsite to your specific needs and wants, and you're sure to have the vacation of a lifetime.